Let the Men Sing! A Cappella is the newest collection of REPRODUCIBLE unaccompanied choral works for TB voices. This budget-stretching collection features classic works, Latin settings, spirituals, multicultural, folk, holiday and Christmas selections. In addition, there is digital access to 3 audio rehearsal mixes for each piece including part-dominant and full TB performance, along with singer PDFs for projection and reproducible options. 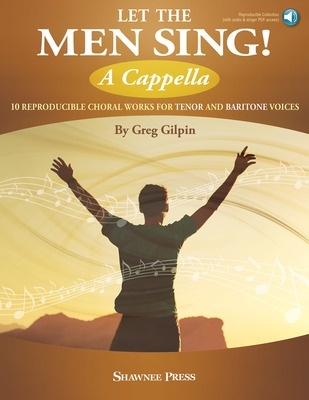 Male singers of all ages will enjoy learning and performing this excellent choral literature and the educator will find it an outstanding tool in developing male choirs and interest in choral singing. Songs include: Come Ye Sons of Art, In Flanders Fields, Keep Your Lamps Trimmed and Burning, Bethlehem Lullaby, Inimici Autem, Star of Wonder, Wayfaring Stranger, Ding-a Ding-a Ding, Ning Wendete, So Take This Song of Joy. Suggested for ages 13 and up.